SMARTLY ORGANIZED TRUNK – Keep your car trunk organized and clean with this incredible multi-compartment car trunk organizer – AutoArrange. The multiple compartments allow you to separate your food, drinks, sports objects, tools, gadgets and work related stuff, all stored in the same trunk, yet separated from each other and well-categorized. 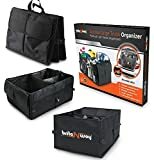 EASY TO USE AND EASY TO STORE – The car trunk organizer can be easily expanded when needed and used to organize objects. When not it use, it folds flat to only a few inches, occupying very little space in your trunk. It has even got 4 meshed pockets that allow you see-through and easily access the frequently required objects by making them quick to find. VERSATILE – The organizer bag can be used even for separating belongings of different people thus making it easier to fetch everyones personal belongings. The organizer keeps objects in upright position, thus preventing accidental spills, and rolling of objects resulting in striking and damaging each other, and making unbearable noises during the trip. FREE GIFT and 100% RISK-FREE SATISFACTION GUARANTEE – With this useful Litter bag, you get an indispensable travel companion – a silk sleep mask & blindfold. Moreover, we also offer you 100% risk free satisfaction guarantee to let you buy with confidence; no questions asked. Would you like to keep all your belongings upright, well categorized and neatly separated from each other? The meshed pockets allow you to quickly access the frequently required objects. The organizer can help you keep belongings of different people separated smartly – thus giving personal space to everyone even in the car. Isn’t that amazing? We also offer 100% risk-free satisfaction guarantee to let you buy with confidence; no questions asked. ORDER NOW TO GET AUTOARRANGE TRUNK ORGANIZER FOR YOUR CAR TRUNK AND MAKE YOUR TRAVEL LIFE A LOT EASIER.